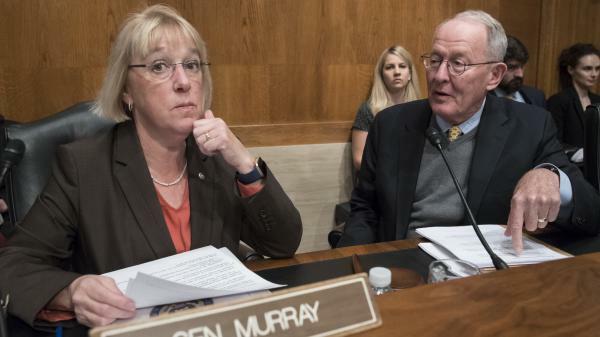 Sen. Patty Murray, D-Wash., and Sen. Lamar Alexander, R-Tenn., leaders of the Senate Health, Education, Labor, and Pensions Committee, meet before the start of a hearing on Capitol Hill. A draft of the bill, obtained by NPR, requires health plans to offer the subsidies as one-time or monthly rebates to consumers or they will be repaid to the federal government. The subsidies, known as cost-sharing reduction payments, are designed to reimburse insurance companies for discounts they are required to offer their customers on copayments and deductibles. President Trump has criticized the payments as a "bailout" and said last week he would cut them off. The bipartisan bill, proposed by Sens. Lamar Alexander, R-Tenn., and Patty Murray, D-Wash., restores the payments for the rest of this year and the next two years. But the lawmakers are seeking to reassure the president that the payments will benefit consumers and not insurance companies. Trump told reporters at the White House Wednesday morning that he was looking forward to seeing the bill. White House press secretary Sarah Huckabee Sanders told reporters on Wednesday afternoon that Trump does not support the deal in its current form. "If something can happen, that's fine. But I won't do anything to enrich the insurance companies because right now the insurance companies are being enriched. They've been enriched by Obamacare like nothing anybody has ever seen before. I am not going to do anything to enrich the insurance companies," Trump said. He had tweeted such concerns earlier on Wednesday. Alexander tells NPR's Susan Davis that he has spoken to the president three times in the past 12 days, including Wednesday morning before the president's tweet. He also reiterated that the effort to repeal and replace the Affordable Care Act would not end because of this bill. "We would like to replace Obamacare, that's almost unanimous in the Republican caucus. But I think it will become increasingly unanimous in the Republican caucus that we understand that between today and the time we can replace Obamacare is two to three years," Alexander told NPR. "And that if we do nothing we'll create chaos, and chaos will lead to a birthday present for Bernie Sanders, which is a single-payer solution — which none of us want." Murray and Alexander are expected to officially release the bill with a list of bipartisan co-sponsors on Thursday. Republicans are working a number of influential senators from the moderate and conservative wings to sign on so the bill can pass the Senate. Republican Senate leaders have indicated they will not waste limited floor time on another failed health care bill, which means the bill must be ensured 60 votes to pass. Senate Minority Leader Chuck Schumer, D-N.Y., criticized the president at length for tempering his initial support for the deal. "This president keeps zigging and zagging so it's impossible to govern," Schumer said on the Senate floor Wednesday morning. "He's totally inconsistent. For it one day, against it the next day. You can't govern — Mr. President, you cannot govern a country, you cannot keep America great, if you don't know what's in the bills and you don't have a consistent policy about them." Schumer said he'd had private conversations with the president in recent weeks in which they both agreed to encourage their respective senators to reach a deal. The bill also allows states to seek waivers to create variations on the Affordable Care Act in their own states. That's been a priority of Republican lawmakers, who argue that state-level legislators and governors better understand the needs of their citizens. "This will give states meaningful flexibility," Alexander said Tuesday in discussing the forthcoming bill. The ACA allows states to apply for waivers to set up systems such as reinsurance programs that protect insurance companies from large and unexpected losses, or high-risk pools to provide coverage to the sickest patients. But many of the state applications have been delayed or denied because of all the requirements laid out in the law. For example, the ACA requires state legislatures to pass a law approving the waiver provisions. The new proposal would simply allow a state governor to sign off on the plan. The bill also restores some of the federal budget for advertising and outreach for open enrollment in ACA health plans, which starts on Nov. 1. The Trump administration slashed that budget by 90 percent. Alexander says he will seek Senate co-sponsors for the bill and then bring it to Majority Leader Mitch McConnell later this week for consideration. NPR's Susan Davis contributed to this report. Full text of the bill and a summary are below. There's a new plan to stabilize the Affordable Care Act for next year, specifically to shore up its insurance markets. Now, this is a bill from a bipartisan group of senators led by Republican Lamar Alexander and Democrat Patty Murray. The centerpiece is a guarantee - a guarantee that the government will keep paying subsidies to insurance companies who sell Obamacare policies. Insurance companies call the payments crucial to keep health premiums low. But President Trump calls them a bailout, and he has sent mixed signals about whether he's going to get behind this bill. PRESIDENT DONALD TRUMP: I won't do anything to enrich the insurance companies because right now, the insurance companies are being enriched. They've been enriched by Obamacare like nothing anybody's ever seen before. KELLY: NPR's health policy correspondent Alison Kodjak is here to walk us through this. Hey there, Alison. ALISON KODJAK, BYLINE: Hey, Mary Louise. KELLY: So the president says he does not want to bail out insurance companies. Start there. Are these payments a bailout? KODJAK: Well, no, they're really not. These would be best described as reimbursements. Because the Affordable Care Act requires the insurance companies to give discounts on co-payments and deductibles to their low-income customers, the law says the government will pay the companies back for that cost. So these are really known - they're called pass-through payments because the government gives the money to the companies, and then they pass that money along to consumers at discounts. KELLY: And remind us of the history here because we're all trying to keep up with all of the twists and turns of what is going on with health care and what the future may hold. These payments have been controversial for a while. They were the subject of a lawsuit. The House sued the Obama administration, claiming they were legal. What was that argument about? KODJAK: So the House argued that the payments have never been appropriated. They never passed a bill saying, you can have this money. And a judge agreed. So the Obama administration appealed, and the judge said the government could continue making the payments during that appeal. But that meant their future's always been in question. And President Trump - from the moment he took office, he's been threatening to cut them off. And finally last week, he said he's ending them for good starting immediately. KELLY: Right, by executive action. What happens if that decision stands? What are the implications if this money goes away? KODJAK: Well, insurance companies have been planning for it because of these ongoing threats. And they still have to give their customers these discounts because that's written into the law. So they basically all announced - or most of them announced that they would raise premiums starting next year. And on average, across the board, those premiums are going up about 20 percent to make up for the revenue that's lost. KELLY: OK, and now into the fray comes this bill. This is the Patty Murray-Lamar Alexander bill which would restore these payments. How exactly would it do that? How would it work? KODJAK: So it would bring back the subsidy payments starting immediately - so next month even. And it appropriates the money for them for this year, 2018 and 2019. But then that creates this whole new problem, which is that the insurance companies, as I just said, have already said they're going to raise their premiums next year because they didn't think these payments would be in place. And that could be what the president's referring to when he talked about enriching insurance companies. They - the subsidies were going to disappear, and now they're not. The bill spends a lot of time making sure that these payments are somehow paid back and go to consumers rather than enriching insurance companies, as the president is afraid that they will. And ultimately, the Affordable Care Act limits how much profit insurers can make. They have to spend 80 percent of their premiums on health care. So consumers could get a rebate that way, too. KELLY: That's NPR health policy correspondent Alison Kodjak. Alison, thank you.